RCN general secretary Janet Davies will relinquish her role at the end of the month, the college announced this afternoon. 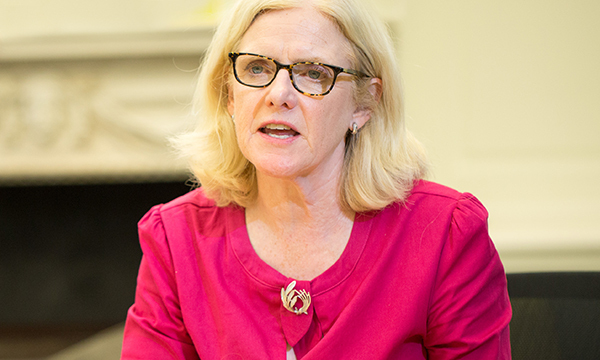 News of her imminent departure from the position, which she has held since 2015, follows criticism of the college’s handling of the NHS pay deal that members voted to accept in June. Dame Donna Kinnair, currently RCN director of nursing, policy and practice, will become acting general secretary until a successor has been recruited. Ms Davies said: ‘It has been a great honour to represent my profession at the highest level, and I am proud of the achievements the college has made over the past three years against a difficult political backdrop. The decision was confirmed by RCN Council chair Maria Trewern, who said: ‘The RCN and Janet Davies have decided to part ways by mutual agreement. The college is awaiting the full findings of a review into the governance and process surrounding the RCN’s understanding and communication of the pay deal before deciding on its future leadership. The review is being carried out by the audit compliance team at Electoral Reform Services. During the RCN’s campaign for members to accept the pay deal, the college said all members would receive an immediate 3% increase backdated to April. However, some members found their July pay packets lighter than they were expecting, with a pay rise of only 1.5%. More than 1,000 RCN members duly signed a petition calling for an emergency general meeting (EGM). The petition stated that the signatories had ‘no confidence’ in the college’s leadership and called for them to stand down. The EGM is due to take place in September. Last month Ms Davies took the unprecedented step of offering a ‘sincere personal apology’ in a letter sent to all members, adding that it had come to her attention that the pay deal was ‘not as straightforward as we said’. Her time in post has covered the whole of the Scrap the Cap and Summer of Protest campaigns to lift the 1% cap on pay rises, as well as the subsequent negotiation of the pay deal. She had promised members in her blog on 6 March 2017 that ‘We will get the pay award that you deserve’. When unions and the government announced the 6.5% pay offer had been agreed between them, Ms Davies called it ‘a step in the right direction’ but vowed that ‘the bigger leap to truly fair pay still needs to be taken’. After the deal was accepted by 77% of RCN members who voted in a ballot in June, Ms Davies assured those who voted against it that their arguments ‘had been heard by the college’.